For the past 40-plus years, Capital Regional Medical Center has built a reputation for providing high-quality, compassionate health care. While maintaining consistent standards, it has embraced change. 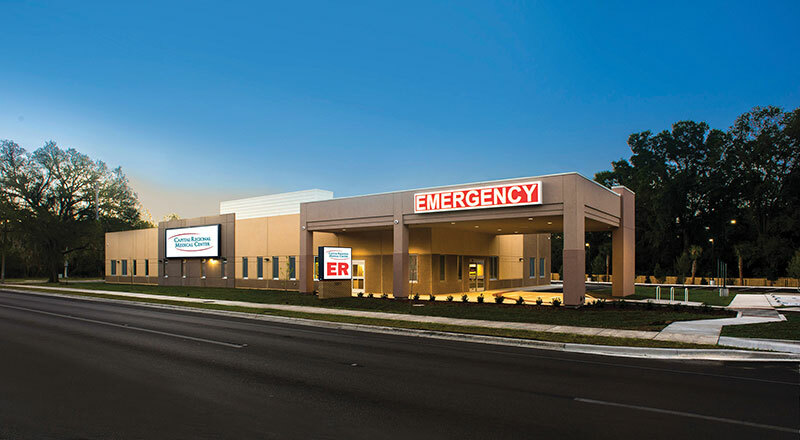 Capital Regional has long welcomed improved health-care technology, advances in best practices and bright stars in medicine to its clinics and emergency rooms, the number of which will grow in 2018 to address the needs of an expanding Tallahassee. In 2016, Capital Regional saw 101,000 ER visits — roughly half of the total visits made to area ERs. To facilitate this goal, each of the 12-bed, 10,800-square-foot ERs will be staffed by approximately 31 individuals, including board-certified emergency physicians, nurses, paramedics, technicians and imaging providers, and they will be equipped with a trauma room, lab, CT scanner, ultrasound unit, X-ray machine and more. These ERs are intended to offer the community a full range of urgent-care services, including pediatric care, 24/7. Data indicates there is a need for additional emergency services in particular areas of Tallahassee. That’s why Capital Regional will build one of its new ERs on North Monroe Street, right off the I-10 exit. The other will be built in a rapidly developing area close to SouthWood; Robinson expects patients will also come to this ER from Wakulla County. “In each of the new, freestanding ERs, we expect to see upwards of 13,000–15,000 visits per year,” he said. Capital Regional expects to break ground on both ERs by Jan. 1, 2018, and he plans for the centers to be open around the beginning of the fourth quarter. The expertise and resources of HCA, Capital Regional’s parent company and one of the nation’s largest private, for-profit hospital systems, will help get them built in this timeframe. Robinson says they’ve got the process down to a science.